Lunar New Year revelers in eastern China may find the streets eerily quiet on Friday as regional officials mull a sales ban on fireworks. Last night, Beijing’s municipal government sent out mass text messages to area residents urging them to set off fewer fireworks or none at all. If current smog levels increase, government officials said that they would suspend the sale of fireworks and ban people from igniting them. Additionally, China’s Meteorological Association announced a “four-alert fireworks index” based on current air pollution levels, asking that the public refrain from using pyrotechnics if the highest level is reached by Thursday. “Firecrackers and fireworks can release large amounts of toxic gas and particles such as sulfur dioxide, which will cause severe air pollution,” said Chen Zhenlin, the association’s spokesperson. In a country plagued by choking haze, the government’s appeal seems to be having an effect. 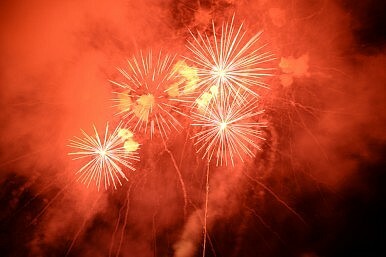 “We have reduced the number of fireworks in the city by roughly 13 percent this year and we are not confident all our fireworks in stock will be sold,” Wu Liyu, the head of Beijing Fireworks Company, told China Daily. Green Zhejiang, an environmental advocacy group based in eastern China, joined the government’s call for cleaner skies during the New Year holiday. The group posted notices on social media and submitted op-ed articles to regional newspapers advising readers to cut down on their use of pyrotechnics. While some Chinese citizens have heeded the advice, others are heaping criticism on the government for targeting a temporary holiday instead of the daily factory and exhaust emissions that generate the vast majority of the nation’s air pollution. New Year’s fireworks are used in China to bring good luck and ward off evil spirits. Friday kicks off a week-long public holiday known as the Spring Festival. With hundreds of millions of Chinese crisscrossing the country to visit relatives via cars, buses and airplanes, perhaps the Chinese government should pay more attention to the root causes of the smog.